Just the fact the universe exists at all is pretty good evidence for God. It's an amazing thing that our universe exists and that we exist! But to stop there would be to do a disservice to what science continues to uncover about how our universe works. You see, it's not simply that the universe exists and we happen to live within it. Modern scientists have found that the universe could have existed just fine in many different configurations, but the laws that govern this universe are tuned very precisely. The way our planet is positioned within the universe is also very unique. What scientists continue to find is the universe is meticulously designed just so that it is capable of supporting life like our own. It's been rigged for life, if you will. The universe is finely-tuned for human existence. In order to understand how this works, I would like to offer an analogy. Imagine that you're lost in a dark, dangerous wood. The temperature fluctuates from extreme heat in the day to frigid cold at night. You have no food and no water. Aside from the other life-threatening conditions, there are dangerous animals that may attack you if you stay out in the open. You need to find shelter if you are ever going to survive. By chance, you stumble upon a cabin in a clearing of the forest. Crawling through an open window, you quickly hurry inside, thankful for your good luck. Luck is all you currently perceive finding the cabin to be. I mean it's quite possible that you could have taken any number of routes through the wood and ended up someplace else, but you just happened to end up here. However, as you start to explore the cabin, you attitude begins to change. First, you notice that there's fresh food in the kitchen, and that the food just happens to be all your favorite kinds. Then, you see that there are some medical supplies in the bathroom that are exactly what you need: bandages for your cuts and scrapes, but also insulin for treating your diabetes. In the bedroom, there's a collection of CDs from all your favorite bands, three books are on the table that are your favorite books, and the reading glasses are your exact prescription! The mattress is the exact firmness you like and all the clothes in the closet fit you perfectly. Finally, you go to the front door, but it is locked. On a hunch, you pull out your house key from your pocket and try it in the door. The key unlocks the front door and you are able to enter and exit effortlessly. After these and many, many more discoveries, you finally come to the conclusion that this is not a random cabin at all, but one designed especially for you to help you survive within this dangerous forest. Before you can create tuna, you must first tune the universe! There are so incredibly many different types of laws that must be present all at the same time for life to exist, each so delicately balanced and perfectly set, that it seems hardly a coincidence. The universe is fine-tuned for life on earth. Sometimes because of our familiarity with a situation, we neglect to think about how many elements must be just right for the desired goal to happen. Returning to our cabin illustration, we see a cabin in a clearing and run to it, perhaps wondering why it's there, but not really thinking about all the conditions it would take to make the cabin. Really, for a shelter to be of any use in saving someone from dying in the woods, it is important that the area where that shelter sits be just right for the type of shelter it is and the materials used to construct the shelter be made out of the right stuff. The shelter also needs to have life-supporting elements inside. Otherwise you will simply be forced to abandon it or die. Let's take these one at a time and look at them more closely. We will examine the first one today and look at the other two in tomorrow's post. In order for a cabin to be built and help a desperate soul lost in the woods, it must be built in a location that has specific properties. For example, no one would want to climb into a cabin and find out it was built on quicksand. The ground must be firm and able to hold a strong foundation. The trees must be cleared away so that there is adequate room for the structure. A cabin built on a severe slope or on the other side of an impassible ravine would make it impossible to get to. Swampy areas would cause the wood that the cabin is built out of to rot. 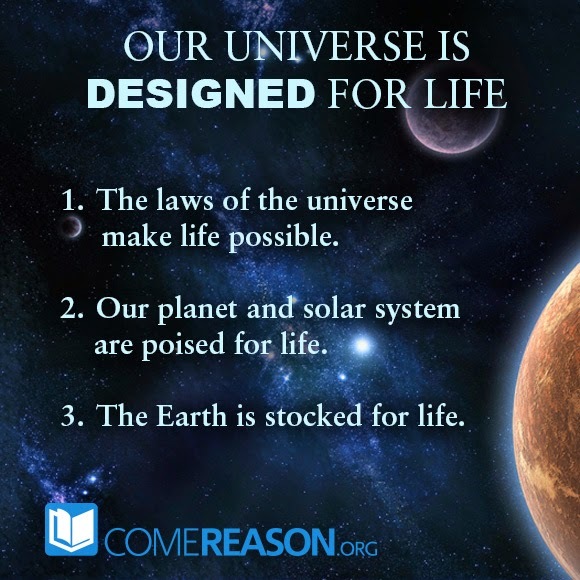 There are many other laws that have a similar crucial impact on whether our universe is just right to even allow life to exist, such as the size of an electron relative to a proton, how fast the universe expands, the age of the universe, the speed of light, the amount and uniform level of radiation in the universe, and many, many more. See table 1 for just some of these balances. 3.Davies, Paul M. "Templeton Prize Address." Arizona State University. 23 January 2010 http://cosmos.asu.edu/prize_address.htm.